Today I welcome Clea Simon. This post is very timely, as I recented moderated a panel on Plotters vs Pantsers (a very odd term, indeed) at Kepler's Mystery and Thriller Saturday. If you're a writer--or a reader-- you'll love this article on What Happen's Next? 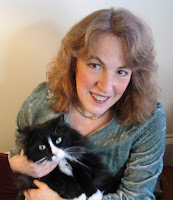 Clea Simon is the author of several mystery series, including the Theda Krakow Mystery series, the Dulcie Schwartz feline series, and the Pru Marlowe pet noir series. She also publishes short stories and appears with regularity in several magazines. She has published three non-fiction books dealing with topics ranging from mentally ill siblings to the connection between women and cats. 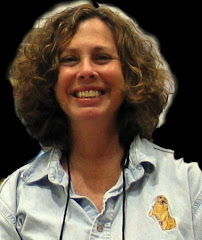 The recipient of multiple honors, including the Cat Writers Associations Presidents Award, she lives in Massachusetts with her husband and their cat. Readers often ask how we mystery writers plot. During panel discussions, this usually leads to a chat about “pantsers” vs. “plotters,” those who let the writing guide us as opposed to those who outline what will happen before the writing starts. But I don’t know if these readers are really asking about our process, per se. Whether they too are writers or are simply fans, reading for pleasure, I think they want to know something more basic. They want to know how we figure out what happens next. I wish I could give them an answer. Sometimes, it’s easy. When a mystery is based on a real-life crime that case can provide at least a bit of path. 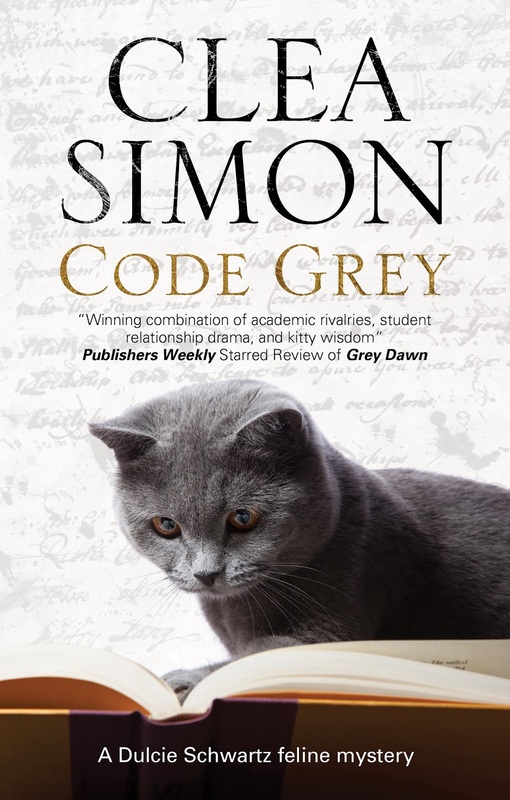 My new mystery, Code Grey, is the ninth in my feline-filled academic series for Severn House. Because my protagonist is a graduate student writing her dissertation on 18th Century books, I try to keep up on what’s happening in rare books – and the case of the Girolamini library in Naples, Italy, did give me some ideas (though I won’t say which ones!). More often, it’s not that simple. Even when there’s a solid spark to kick off the book, the questions begin early. Usually, I’ll start with an idea or a scene in mind. A troubled former scholar is found unconscious deep in an excavation, with a rare book tucked into his coat. He’s assumed to be homeless, only the book is in good condition – and it has been missing for thirty years. Where has it been? Who found him? Was anyone watching? Why does he have that book? Did he steal it or save it? And will he ever wake to tell us? In short, what happens next? To answer these questions, we ask ourselves the same questions readers do. And in the best cases, we – like our readers – let the story unfold for us. I know other writers have spoken about this, but I will say it again: Sometimes, the best times, the story tells us where it wants to go. I might write a scene in which Dulcie jumps down to help the scholar, but then I’ll stop. Dulcie will feel sympathy, for sure, but she’s not a jump-into-a-pit type. She’s an academic, a bookish girl who is not athletically inclined. And so I delete that passage and have her going for help … only on the way, she meets someone. Or hears something… or …. Before I know it, the story has taken off on its own direction (and, don’t worry, I haven’t forgotten about that poor scholar. We’ll get him out of that hole somehow). By being true to my character, by letting Dulcie be Dulcie, the story takes on a life of its own. A life that, I hope, will be more realistic to my readers – will feel less manipulated, despite the odd ghost or benign feline spirit that haunts this particular series. For the record, I’m a “pantser.” I rarely know exactly what will happen with my stories as I begin them. This means I have to do a lot more revision after the first draft is done. After all, the character who ends up being the murderer might seem like a nice guy in the first five chapters, but there ought to be some hint that he’s not, right? My books are somewhere along the cozy-traditional-amateur sleuth continuum, and part of my deal with my readers is that my books should function like a puzzle – a riddle they, too, can unravel if they read carefully. I’m not going to surprise anyone with an identical twin villain or a last-minute newcomer responsible for all the mayhem. But I’ve spoken with enough of my colleagues to know that this kind of serendipity is not unique to pantsers. In fact, I’ve heard more than one plotter laughingly talk about crafting a detailed outline … and then throwing it out the window when a character refuses to go along with the program. Because ultimately we mystery authors are not concerned simply with producing the manuscript, despite the deadlines and waiting publishers. We don’t simply want to get the story written. We, too, want to know what happens next. Interesting article. Love the beautiful cats on her cover. Interesting article. Love the beautiful cats on your covers. Thanks for reading, Elaine! Severn House does wonderful covers, and all my mysteries end up having cats in them (I've tried to write without cats, honestly!) so I guess it's a natural pairing. Then again, have you ever seen a cat that wasn't beautiful (in some way)?